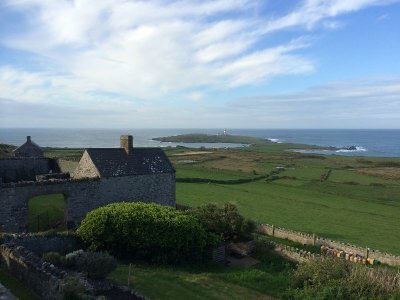 Bardsey Bird Observatory by Steve Stansfield. Each year the BTO provide a number of grants of up to £200, to support young people looking to visit one of the accredited British and Irish Bird Observatories. Priority is given to applicants aged 21 or under who are able to get fully involved in fieldwork and general observatory activities. A brief statement of experience and their plans for the visit. Outline costs (travel and accommodation only; food is not covered by the grants or Observatory). Where possible, a reference from a BTO member. If the applicant is a ringer, this should be from their trainer, or another 'A' permit holder. If the application is successful and the applicant is under 18, written consent of a parent or guardian will be required. Further details can be obtained by emailing nick.moran [at] bto.org. The applicant will need to have reserved a place at an Observatory (subject to approval of the grant) for a visit of at least 4 nights during the current year. Confirmation will be needed that the Observatory can host the young person as a volunteer. Applications are considered by a committee comprising a member of the Ringing Committee, a representative from the Bird Observatories Council, two members of staff appointed by the BTO Director and an independent monitor. Funding for these grants is provided by a generous donation, matched by BTO funds. Permission from a parent or guardian for applicants under 18 will be requested later if the application is successful. If you would like to support young birders please email us at fundraising [at] bto.org. The application process is now open for 2019 submissions. In order for us to be able to contact you about your application, please provide a current email address. Please state the Bird Observatory that you have organised to visit, including the region where it is located. Your stay at your chosen Observatory must already be confirmed. Please briefly note your current birding, surveying and ringing experience, and why you would like to visit the stated Bird Observatory. Please briefly state your estimated costs involved in visiting the stated Bird Observatory for a period of at least 4 days. Please include details of a BTO member who can provide a reference. Include their name, contact details and level of involvement in BTO surveying or ringing (i.e. member of a group or responsibility for survey squares, regional representative or trainer, etc.). If no such person is available, your referee should be an adult who can vouch for your birding skills and suitability for volunteering at an Observatory. Please tick if under 18 and able to provide written permission from a parent or guardian (this will be requested if the application is successful).